I told somebody today that I miss teaching. With the unprecedented Media Bias against Ron Paul in the current US Republican primaries, I could show the students the Media Studies theories in action – like Agenda-Setting, Gate-keeping, Propaganda Model, etc. I doubt if there is any Filipino Communication / Media Studies teacher in the country who is doing such a thing. She asked, isn’t there a Muslim school where you can teach? Huh? Muslim school? But I don’t have a degree in Islamic Theology. My degree is M.A. Media Studies – the first Filipino to get such degree from UP-Diliman. I have a 1.0 (equivalent to 4.0 in the US) GPA which qualified me for membership to at least 2 international Honor Societies like the Phi Kappa Phi. I also had the College’s Best Master’s thesis. At the same time, I was President of the Graduate Students’ Association. I lectured at UP and Kalayaan College. I have been writing for various publications since 1998 and even won a Journalism Award. I also have a peer-reviewed academic article published. All these qualifications are good ONLY for a MUSLIM school?!?! Since my father was a judge, I wanted to be a lawyer when I was a child. My father was the first Muslim lawyer in the Philippines as well as first Muslim fiscal and Judge of the Court of First Instance. He died when I was but 5 and a half years old. When I went to college, the Philippines was under Martial Law. What would a lawyer do under Martial Law? So, I changed my mind and took up instead Petroleum Engineering at the top engineering school in the Middle East at that time – the University of Petroleum & Minerals (later renamed King Fahd University of Petroleum & Minerals) at Dhahran, Saudi Arabia. Being the First and only Filipino petroleum engineer, with on-the-job training at ARAMCO, practicum at the Technische Universitat Clausthal in Germany and study tours in Germany, Mexico and Algeria, I thought that I could do something for the fledgling oil and gas industry of the Philippines. I thus went home to work instead of working abroad even though petroleum engineers were in demand everywhere in the 1980s. To my shock, oil companies in the country did not want to touch me with a ten-foot pole. I thought it was because my family was opposed to the Marcos regime. But even when President Marcos has already been deposed, I still could not find work as a petroleum engineer. So, I tried my hand in other fields – from Sales to Real Estate brokering (I took and passed the real estate licensure exams) to capital markets to management consultancy. Later, I took the top-level Strategic Business Economics Program (SBEP) of University of Asia & the Pacific, one of the top economic research centers of the country. Since I love writing, I started writing for a newspaper and later, for magazines and other publications. I even won a Journalism Award. But then, it was not easy for me to find a writing job when people learn that I am an engineer. For some reasons, people generalize that engineers cannot be good writers. To remedy the situation, I enrolled at the University of the Philippines for the degree of M.A. in Communication, Journalism major. After finishing practically all the academic requirements except for the comprehensive exam and thesis, the College of Mass Communication opened its M.A. Media Studies – Film specialization program. The Dean, at that time, knew that I was very interested in Films. She invited me to be one of the first students of the program. I asked if I could have a double degree because I was nearly finished with my M.A. Comm (Journalism) requirements. Unfortunately, she said that “there was no such animal” (referring to double degrees) in the College. At any rate, she said that all my units were to be credited but I had to take additional ones for Film and Media Studies. And so I did. And so, I was not only the first Filipino to graduate with an M.A. Media Studies from UP , I was also the first Filipino to graduate with an M.A. Media Studies (Film) from the UP Film Institute. If I am not mistaken, the second Filipino to graduate with that degree from the UP Film Institute did so only in 2010, at the earliest – six years after I graduated. When the UP Film Institute announced its vacancies for regular teaching posts (I was then teaching there as a Lecturer), I was invited to apply. (At UP, one has to be invited in order to have a chance of being accepted.) Unfortunately, instead of hiring me, they chose two Filipinos WITHOUT M.A. degrees and had NO academic or work experience in Media or Film Studies. They also got a FOREIGNER. In our very Constitution, I think it is clearly stipulated that NO FOREIGNER should be hired if a FILIPINO is qualified for the job. Yet, whether as a Petroleum Engineer or as a professor of Media Studies and Film Studies, Filipinos prefer to hire a foreigner over me. Perhaps they did not consider me a Filipino? I am a Moro, after all. It appears that being the first Filipino to earn a degree in a particular field doesn’t mean much in the country. I wonder if it is because I am a Moro (indigenous Muslim in the Philippines). Perhaps I should take a PhD in say, exobiology (study of life BEYOND Earth)? Maybe then, I can find a job in the Philippines? If Filipinos won’t hire me, perhaps I can apply in Mars? Blogging as Journalism, Diary Writing, Note-taking, Promo Tool, etc. In the recently held 3rd Philippine Blogging Summit, a couple of speakers talked on Blogging as Journalism. From the way they talked, it was as if ALL blogging is journalism or that ALL bloggers are considered journalists. Really, just because the speakers are journalists and they blog does not mean that all bloggers are journalists. Blogging can be journalism. That is obvious. Some journalistic blogs give news updates even more frequent than established news websites. But blogging is much much more than journalism. First and foremost, it can be an online diary. One could be the present-day counterpart of Samuel Pepys or Anne Frank. In fact, most blogs are of the diary type. Or, it can be an online notebook. As one of the speakers in the Blogging Summit said, he uses it to write his notes on a possible creative work or an ongoing creative work, say, a novel. A student can use the blog as index cards when doing research. With its hyperlink capabilities, a blog is more useful than an index card. I also see a lot of blogs that work as a reference material. The bloggers list down the sites for particular things, say a list of sites on particular subjects, e.g. homeopathy or herbal medicine. A blog is also a good promotional tool. Instead of advertising on other sites, one can make one’s own blog advertising one’s product(s) using the blog format. It can be the counterpart of TV’s infomercial. One speaker in the Summit said that one’s blog can be one’s Résumé. From the time I first made my own website, I have always put my résumé online, some of them complete with all the icons and hyperlinks. The purpose of putting my curriculum vitae online is not to look for employers but to show to the readers of my sites my credentials which make my writing more credible. A blog can be one’s virtual organizer or even one’s virtual filing cabinet. And the beauty of a blog is that it can be kept personal or be accessible to a few people or a group or it can be open for the world to see. The ‘Net made everyone an instant publisher. And the blog has made it even easier for people to create their site. For me, I use the blog as a platform for my ideas. While I also write for the print medium, the World Wide Web has made the whole world my potential audience. One of the Blog Summit’s speakers, Manuel Quezon III, said that he sees blogs as the online equivalent of pamphlets and some bloggers like himself as pamphleteers. That was exactly how I saw myself in the late 1990s when I made several websites. Like the pamphleteers of old, my writings were full of polemics. I have since mellowed down and now, I write with as little polemics as possible. I certainly do not want to sink into the level of countless American, European and some Filipino / Fil-Am bloggers who write venomously against Islam and the Muslims. For Moro writers, the ‘Net may be the only venue for their works. I have tons of manuscripts gathering dust in my shelves or forgotten in various diskettes. With the ease of blogging, I might put them all up on the Web. Some day, I’ll have them published in book form. 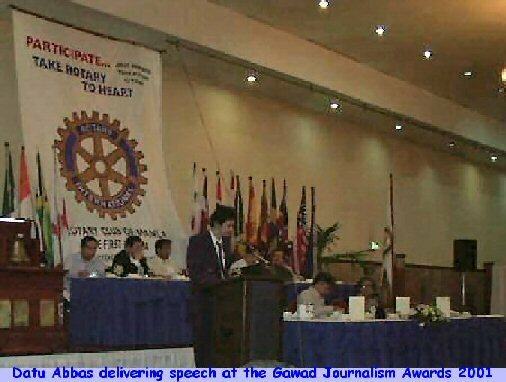 This reminds me of the time I won the Gawad Kalinangan Journalism Awards 2001, the prestigious annual journalism awards by the Manila Rotary Club. Below is the acceptance speech I gave and a couple of photos of the event. ‘Assalammu ‘aleikum. I would just like to say a few words about Moro writers and the Moro problem. The semanticist Wendell Johnson stressed that no matter what we try to talk about or symbolize, we inevitably talk about ourselves. Corollary to this, he emphasized that no two people perceive reality in the same way. Today’s headlines once again highlight the so-called Moro Problem. I believe that the Moro Problem is not a military problem, it is a communication problem. Throughout the history of the Philippines, from the Spanish to the American and to the present regime, most of the stories about the Moros were written by non-Moros; i.e., the non-Moros talking about themselves — their own perception of the Moros, which may have nothing in common with the Moros’ perception of themselves. Christians writing about Moros may even foster simply more misunderstanding. Words are all that journalists and writers have. But words are not mere things; they are symbols. One word may mean one thing to one person, and may mean a totally different thing to another. The word Filipino for example means differently to a Tagalog and to an ordinary Maranao. I believe we can solve this problem only through a real understanding of the issues involved. And the best people who could be instrumental in fostering such understanding would be the Moro writers. The Moro writers simply have to write about themselves – their values, aspirations, beliefs, etc. And the non-Moro readers can try to empathize and truly understand these sentiments without making any inferences or judgments. 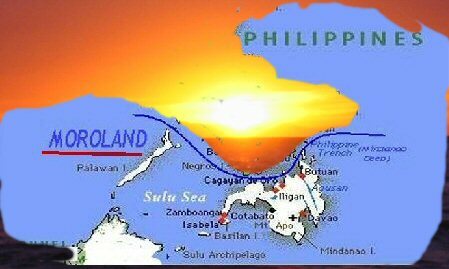 For more than 400 years, the Spaniards and the Americans have inculcated in the minds of generations of Filipinos that “a good Moro is a dead Moro.” Such a conviction cannot simply be denied or swept under the rug of history. The Christian majority must exert an honest-to-goodness effort to understand the feelings, sentiments, biases, ideals, prejudices, customs, traditions and historical experience of the Bangsa Moro, as enunciated and articulated by the Moros themselves. Sad to say, there are only a handful of Moro writers, not for lack of talent, but for lack of opportunity and access to media organizations. But this prize means that the Communication Gap is getting narrower. So there is hope. 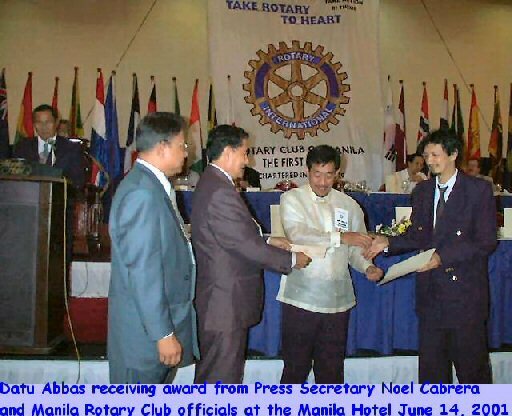 The Rotary Club of Manila’s Journalism Awards that focus on Culture is indeed a great idea. I’d like to thank the Rotary Club of Manila, the UP College of Mass Communication and most especially to Ms. Llita Logarta, my editor at The Philippine Post, for her sincere desire to learn more about the Moros and see my articles published.